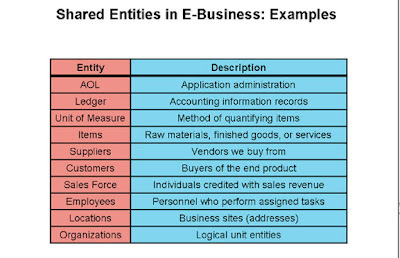 Shared entities are not formally defined within the user guide of any single product. But when you implement multiple products, you will find that multiple products reference the same entity. However, it is important to know what these large structures are, and to involve experienced team members when implementing EBS. 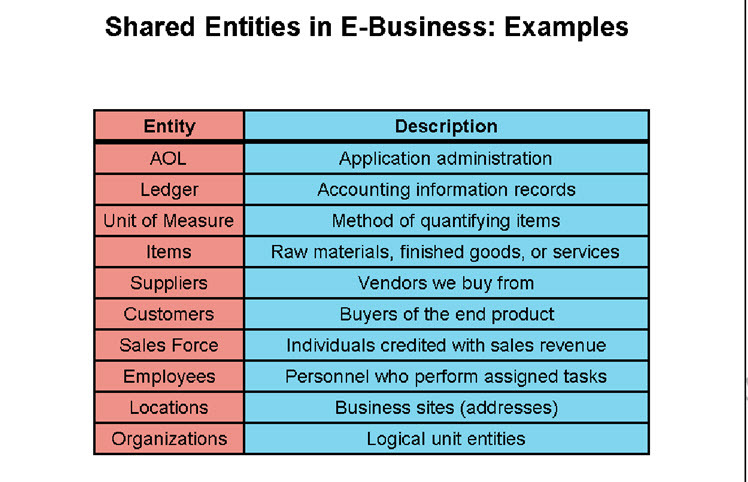 The above list of shared entities is incomplete and is only intended to give you an example of how shared entities are used throughout and across R12 E-Business Suite. Currencies: If you are performing a multi currency implementation, the currency that you are planning to deploy must be enabled in AOL. Languages: The languages that you are planning to deploy must be enabled in AOL. Users: AOL provides the functionality for creating a user. A user must have a username with one or more responsibilities assigned. Responsibilities: Users are assigned responsibilities that provide access to specified modules in EBS. Menus: Responsibilities have menus associated with them. Menus determine the functions available to a responsibility, as well as the actions that a user can perform using their assigned responsibility.